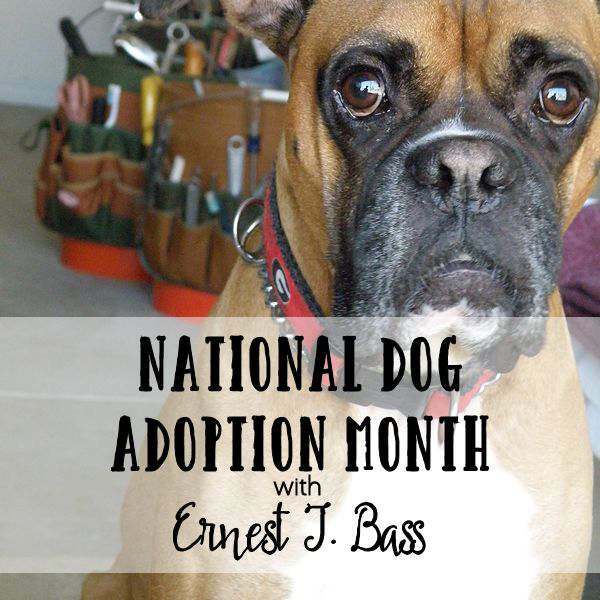 Its National Dog Adoption Month here in the USA and I just had to share my thoughts on this subject. I was adopted 10 years ago by mom and dad and I am so happy they chose me to be part of their home. I was found running the streets of Tampa. Getting into fights, sick and hungry. 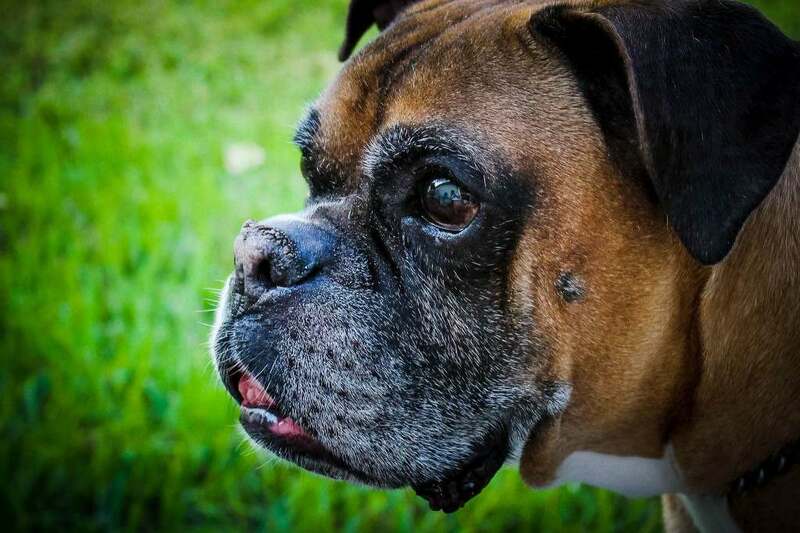 If it wasn’t for Florida Boxer Rescue, I guess I would’ve…….well, I don’t want to think about what might have happened to me out there all alone. I remember the first time I saw Mom. I jumped and jumped and couldn’t wait to jump in her lap for a nice long nap. Yes, I know I am a 60-pound dog, but I’m still a lap dog. People have asked my Mom and Dad where they got my name. I actually came to my new home with the name of Ernest. Mom and Dad loved The Andy Griffith show and if you know anything about the show you will know the character, Ernest T. Bass. Mom and Dad say the tv Ernest and me act a lot alike. I don’t know about that. The picture is from my first day in my new home. I was a handsome dog of 5 years and I was scared. I didn’t know what it was like to be loved, but I learned quickly how nice that can be. I still get a little scared when I’m left home by myself. But I know they will come back and let me out of my kennel. Why do I have to stay in a kennel you ask? Well, I can open deadbolts and get out of the house. That’s not safe for me, so I have to stay in a kennel while they are gone. My life has been so full with tons of things to do. I went to school the first year I was in my new home. I didn’t like it. They made me follow rules and all I wanted to do was play with the other dogs. My mom said I needed to learn “manners”. Whatever that means. But as you can see in the picture I won 2 awards. Most Improved and 6th place in Following Directions. There were 6 dogs in the class. As you can see from my expression, I didn’t like it. I love all my toys. I have a basket full when I feel like playing with them. I haven’t learned how to put them back in the basket when I’m done though. Actually, I don’t want to learn how to do that trick. It just doesn’t make sense when I will come back in a few days or weeks and play with it again. 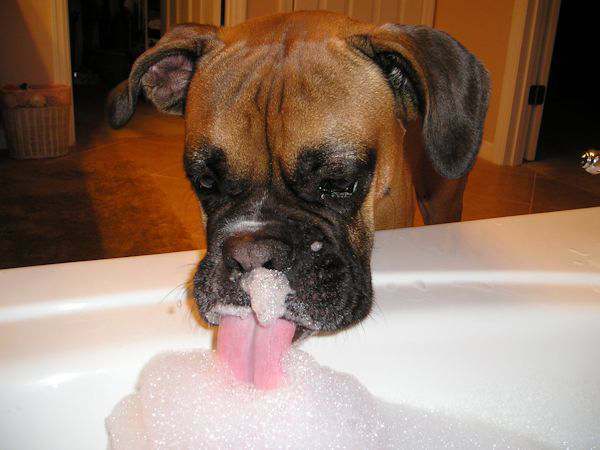 And, for some reason, I love to lick bubbles. That’s just the way I roll sometimes. I get to go on trips all the time with Mom and Dad. 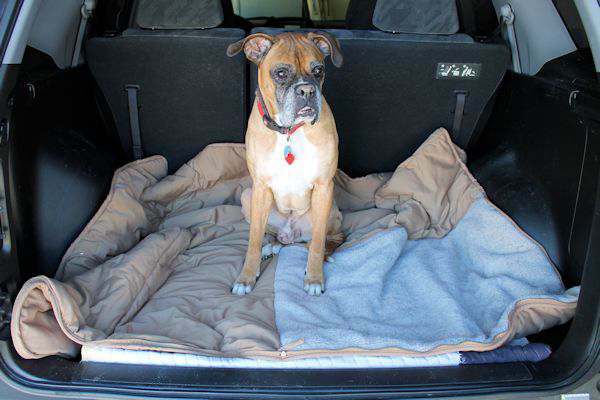 I love my bed because it will unfold and I can have a comfy place in the back of the car while we travel. My favorite trip to take is to the dog park. It’s so much fun. They have a park just for us fur babies. 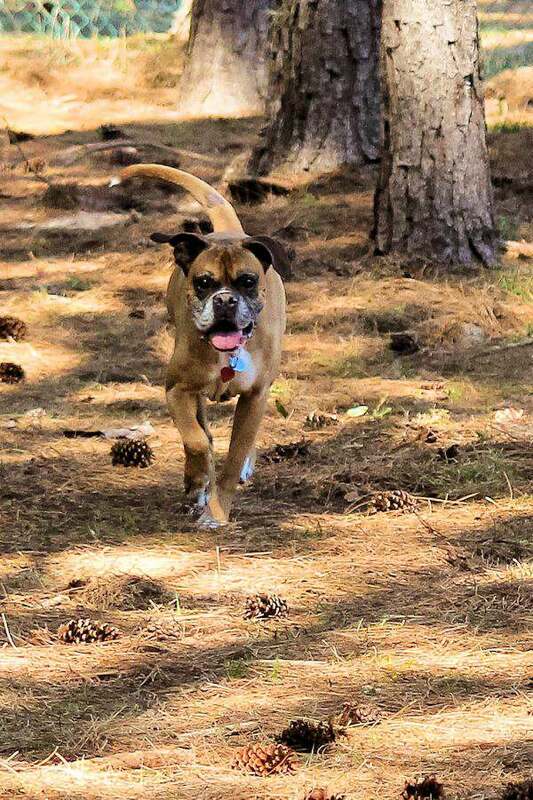 I can run and run and don’t have to be on a leash. It’s always fun there. Went to the beach one time. Did you know they have beaches just for us fur babies? 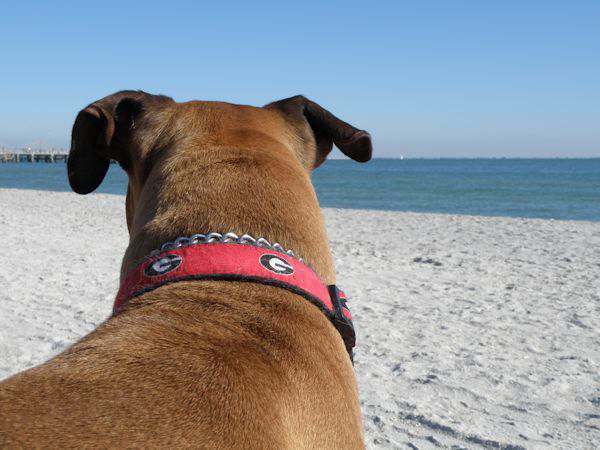 I sat and watched the other furkids play in the water but all I kept thinking about was that movie with the big shark. You know the one with the dog that didn’t have a very long part in it? I kept those paws on solid ground. 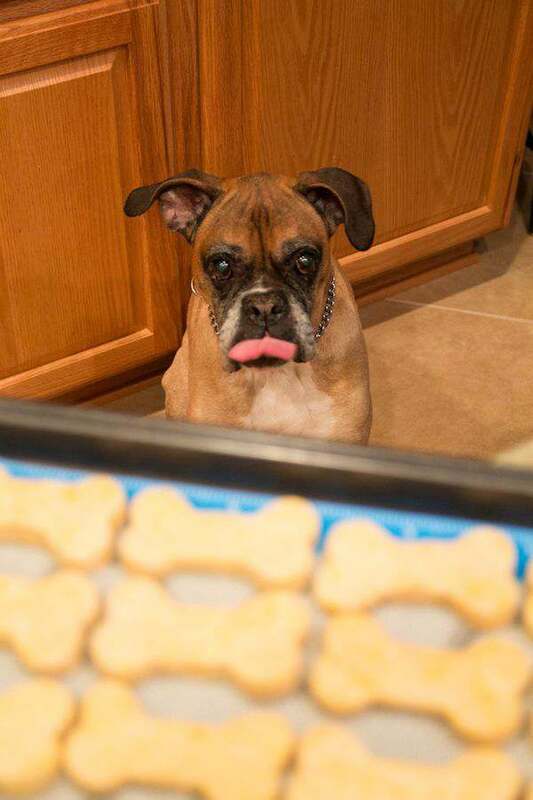 I get to deliver Dog Cookies to the neighbors at Christmas time so they have plenty for their fur babies and if I come over to their house, there will be one or two or three cookies for me to have. Mom makes me dress up. It’s embarrassing to a handsome fella like me. I love it when Mom makes me cookies. 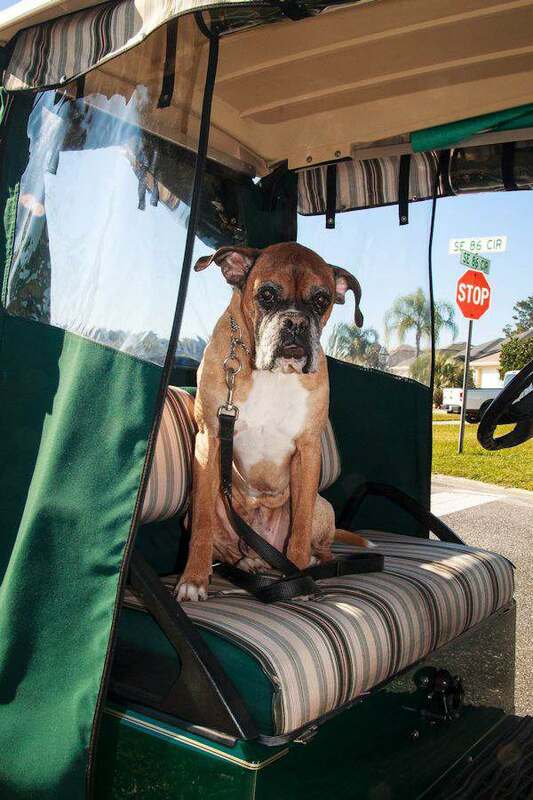 I even enjoy riding in the golf cart now. That picture was taken before I realized how much fun it is to ride in one. The years have been so good here in my fur-ever home and I would love to see other fur babies have a home like mine too. I hear from my other fur friends that some of them came from shelters too and they are so happy to be in their fur-ever home. I’m 15 years old now and its harder to get around and I like to nap a lot. But I know I am safe and there is food in my bowl when I’m hungry. I don’t have to worry about anything but enjoying life with Mom and Dad and having fun! 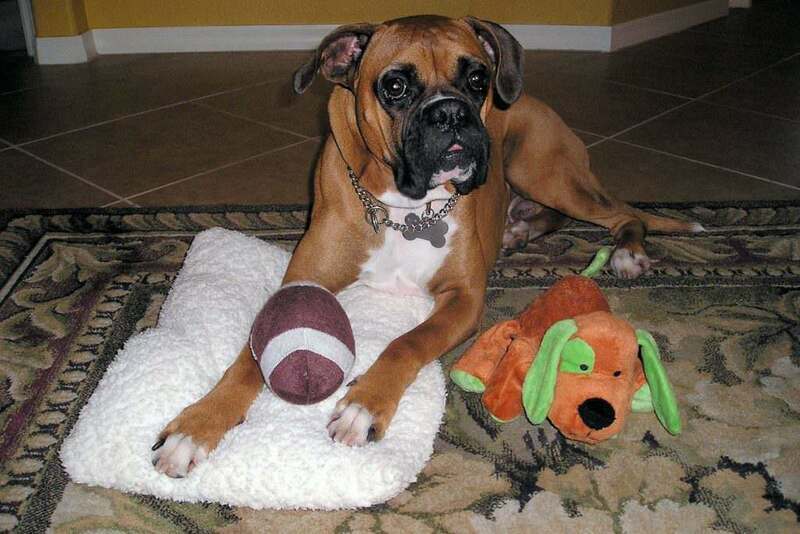 Please check your area shelter for your next pet or your local rescue like Florida Boxer Rescue. There are many rescues out there who are breed specific. Our dog, Milo, is adopted. I can’t even imagine getting a dog that was not a rescue. It’s such a great gift for those poor dogs. You can definitely see how much Ernest loves his family and life in these photos! He has the cutest mug. 🙂 My brother has decided it’s time for his family to add a furry family member and has been doing some research on rescue groups in our area as well as checking in at our local animal shelter. I really love my fur ever home. I wouldn’t want to go any where else. OMG he is absolutely the cutest dog ever! I love that he has a little stuffed doggie toy, too! So sweet! 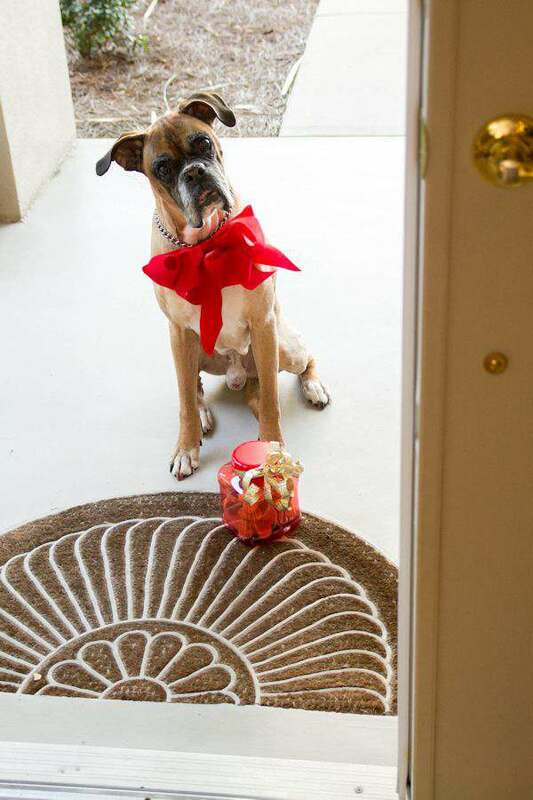 *big boxer kisses* Oh thank you so much. I consider myself handsome though. Cute is for those little dogs. Aww, you’re so adorable! And such a lucky little fur baby too! You’re so active and playful as well, aren’t you? *slurp* Awww. Thank you. I am a very lucky fur baby. My dog is a rescue dog. I love her so much I can’t stand to think of life without her. Thanks for stopping by. I don’t know what I would do without mom and dad. I am a dog lover so your pictures really touched my heart. I think that rescue dogs turn out to be the best dogs, it is like they know you saved them. I remember my dog oddie was addopted two years ago, we really love him so much. He is so sweet! 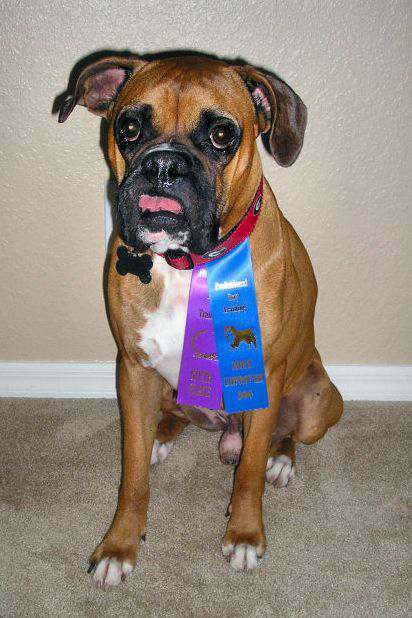 I remember when our boy (Carter) was adopted… his gottcha day was a BIG scramble! Adoption is the best! AAAAAAAWWWWWWWWW. I am sweet. And I would love to sit in your lap and take a nap. Thanks for reading my story. When I become more stable I am definitely adopting a dog. I have seen so many lovable dogs at my local animal rescue shelter. My sister dog was adopted 2 years ago his name was hatchi and we love him so much. He is also a sweet dog. oh is he that famous Hatchi that had his own movie?. That one made my mom cry really hard. Oh I would love to meet him someday. Love the name. You are one handsome dog. Congrats on your awards when you went to school. I love you Christmas get up! Lol. Aw thanks. 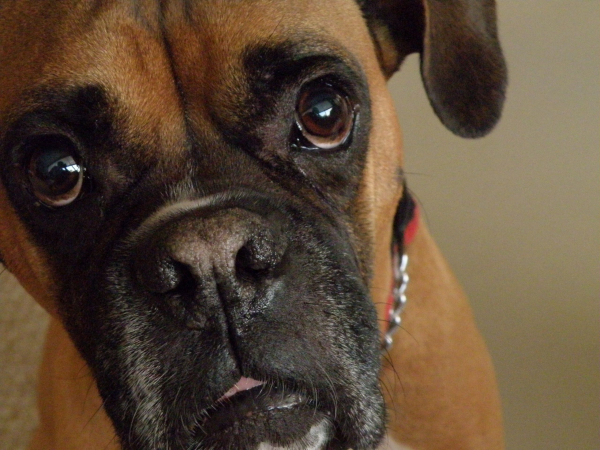 If a boxer could blush I would be right now. It’s so important to look and try to adopt a dog first. We took in my boyfriends grandmother’s dog after she passed. Bella has been a delight to have in our home. Oh he is just too cute and he’s really living the life! I’m glad Ernest was able to get off of the streets and into a loving home. I hated the streets. People were mean to me and I had to fight other dogs to eat. I’m glad I don’t have to fight for food anymore. I love that you gave him such a happy home. And awww to the bow picture. What a sweetheart.